BACKGROUND: SILS provides a means of performing routine laparoscopic surgical procedures with better cosmetic outcomes and less trauma to the abdominal wall, and has been hypothesized to result in fewer complications. While it is well known that incisional hernias can result from both open and multi-port laparoscopic surgical cases, recent studies have raised the concern of an increased incidence of herniation following a SILS approach. In the present series, we report an estimate of the incidence of post-operative complications including herniation among 111 patients status post SILS. METHODS: The study involved patients who received a SILS procedure between November 2008 and July 2010, including cholecystectomy GB (93), appendectomy (AP) (14), lysis of adhesions (2), ileocecectomy (1) and right hemicolectomy (1). Patients were contacted by a doctor with whom they completed a screening questionnaire which evaluated for post operative pain, infection, or mass formation. A chart review of patients with positive screens was performed. RESULTS: Surgery was essentially uneventful in all patients. There were no conversions to open laparotomy, Eleven (9.9%) required additional port introduction. Ninety four percent of the patients were discharged on the day of surgery (> 24 hours = 3 AP, 2 colon surgeries, 2 GB). One AP patient had a wound infection. All patients were evaluated at 2 weeks post-operatively. All wounds were healed and there were no returns to office after this evaluation. A total of 74 persons answered the follow-up questionnaire (66.7%). These patients had a median follow up of 12.9 months (range 2-22 months) and were unanimously content with the results. Complications were identified in 4 patients (5.4%), with a likely diagnosis of umbilical herniation in 3 of these patients (4.0%). 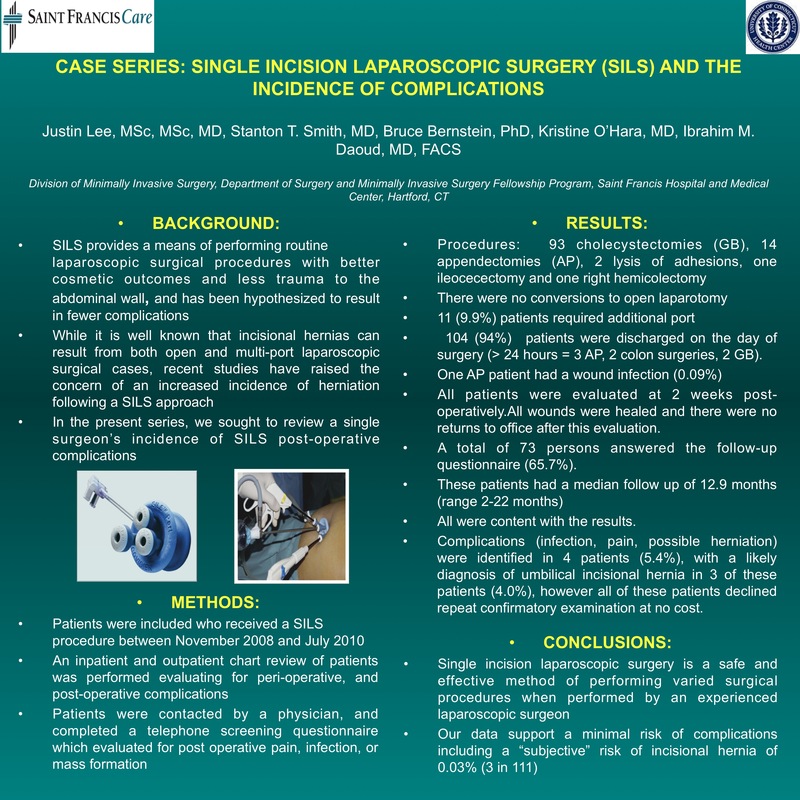 CONCLUSION: Single incision laparoscopic surgery is a safe and effective method of performing varied surgical procedures and does not appear to pose a significant risk of complications, including umbilical herniation.